Making the rounds at the Republican National Convention, the virulent critic of Islam embraces the Republican nominee’s message and candidacy. Cleveland—Former New Hampshire US Senator Gordon Humphrey had some strong words for the supporters of Donald Trump who have repeatedly blocked efforts to open up the debate—about the nominating process and their controversial candidate—at this week’s Republican National Convention. “I sought to be recognized to raise a point of parliamentary inquiry and was immediately drowned out by people I would refer to as brownshirts,” said Humphrey, who is a member of the New Hampshire delegation to the convention. Humphrey’s comments created an embarrassing stir after he made them in an interview with MSNBC. As Republicans attempt to “turn the page” on a divisive primary campaign and focus on Trump’s fall presidential bid, they do not need their nominee’s name to be associated with European extremists of the past, or of the present. Yet references to Trump as a “neo-fascist,” and to his campaign as an American expression of contemporary European far-right extremism, keep coming up. When Trump leaped to the head of the Republican field, he delivered the appearance of legitimacy to a moral vision once confined to the fevered fringe, elevating fantasies from the message boards and campgrounds to the center stage of American life. In doing so, he pulled America into a current that is coursing through other Western democracies—Britain, France, Spain, Greece, Scandinavia—where xenophobic, nationalist parties have emerged since the 2008 economic crisis to besiege middle-ground politicians. In country after country, voters beset by inequality and scarcity have reached past the sober promises of the center-left and the center-right to the spectre of a transcendent solution, no matter how cruel. As it happens, Europe’s far-right extremists recognize the connection. 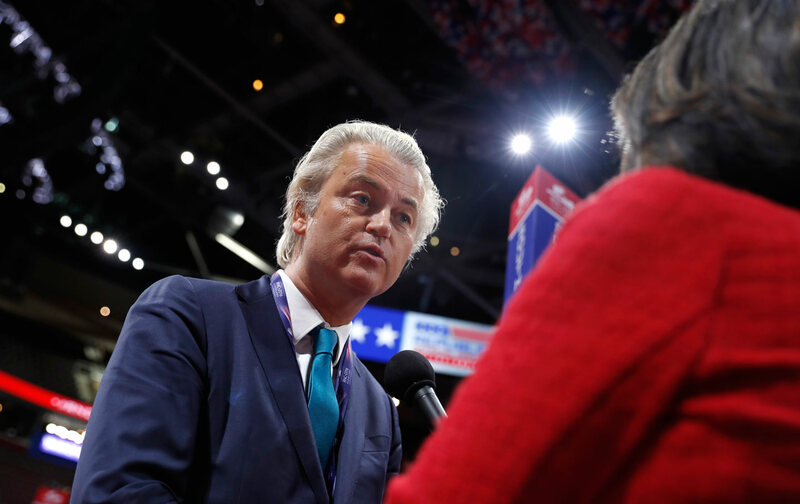 Dutch Party for Freedom leader Geert Wilders—whom London’s Daily Mail newspaper has referred to as “the latest and most extreme face of anti-Islamic sentiment to claim leadership of the growing political far-Right in Holland”—is especially excited that Republicans have nominated Trump. “I wish we had political leaders like this in the Netherlands who defend their own country…. and forget the rest,” declares Wilders. Since arriving in Cleveland, Wilders has been tweeting and retweeting pictures of himself with top Republicans, such as Tennessee Senator Bob Corker and Iowa Congressman Steve King (under a Twitter account banner that reads “De-Islamicize”). He spoke to a “Twinks for Trump” gathering of the nominee’s LGBTQ backers. And he has been talking up Trump with Dutch and American media. “In America you see the same happening as in the Netherlands. The hard working people, what they call the blue collar workers here, no longer feel represented by the political elite. That people no longer want the policy of open borders, immigration and Islamization,” he told Holland’s Telegraaf newspaper. That, says Geert Wilders, is why he wishes there were more political leaders like Donald Trump.